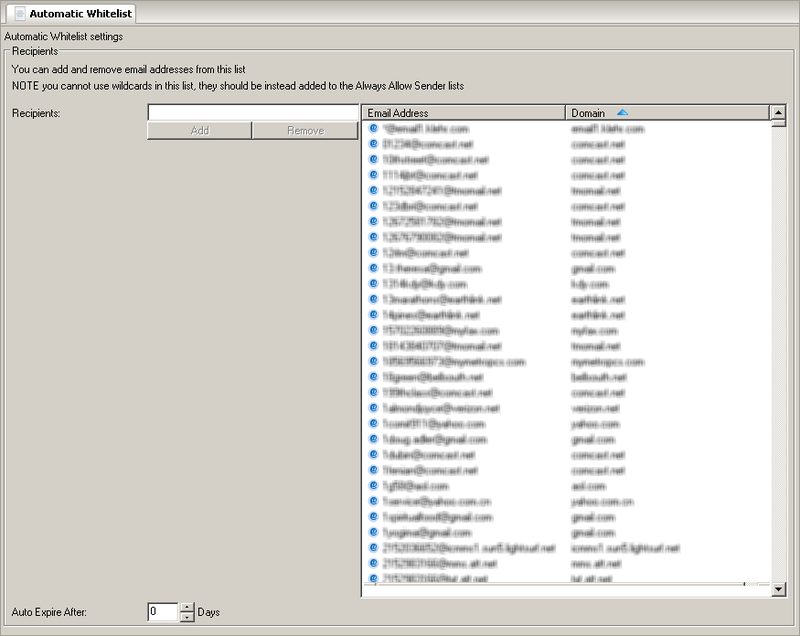 Hexamail Guard builds up a list of recipients who have received emails from users in your domain(s). These receipients can optionally always be allowed to send emails that bypass the SPAM blocking module entirely. In this way an automatic whitelist is built up, ensuring that over time, legitimate emails from known users are never incorrectly blocked. In order for this functionality to be operatinal, you need to ensure outbound emails are sent through Hexamail Guard from your email server: often this requires instructing your email server to use Hexamail Guard as its outbound or delivery SmartHost. Please see the documentation on setting up your email server for more information. This page allows you to add or remove entries from this list, in case an external user has been incorrectly added to the list: for example, if one of your users replies to a SPAM email. This setting controls when to expire the automatic whitelist entries from the list.